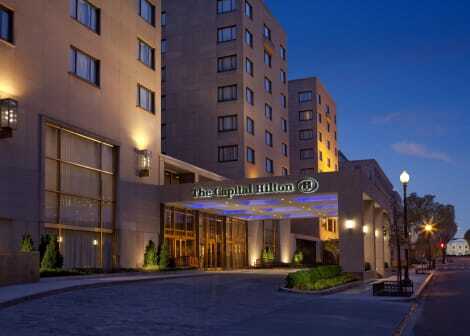 Welcome to Hilton Washington DC National Mall, just steps from a wealth of DC attractions, corporations and federal offices. Walk to the White House, monuments, museums and the Southwest Waterfront, and take our elevator down to L'Enfant Metro Station to connect with greater DC, Maryland and Virginia.Guest rooms are stylish retreats with floor-to-ceiling windows, platform beds, and comforts like complimentary WiFi, a 55-inch TV and mini-fridge. Choose a suite for separate living/dining areas, views of the National Mall or Potomac River, plus options like a dining room, fireplace and powder room.Book a suite or executive room for access to the Executive Lounge featuring concierge services as well as complimentary continental breakfast and evening hors d’oeuvres.Join us at Washington DC Restaurant showcasing farm-to-table cuisine or stop by our cafe and market for coffee and baked goods. With a focus on small plates, local beer and handcrafted cocktails, our lounge is a great place to spend an evening.Follow up a busy day with a dip in our large heated outdoor pool. Set on the 12th floor, this resort-style area also features cabanas, fire pits and cozy lounge seating. Re-energize in our complimentary fitness center with a range of cardio machines and free weights.Our National Mall hotel offers 23,000 sq. ft. of meeting space for occasions of every size. Plan your event with a choice of grand ballrooms, innovative conference rooms, pre-function spaces and an impressive Solarium. Newly opened, All Suite Hotel, City Center 2 blocks to METRO.Homewood Suites DC Convention Center in the Heart of DC, 2 blocks from Walter E Washington Convention Center, 4 miles to DCA, 1 mile to Union Station.Our All-suite hotel is a quick walk to popular restaurants, National Mall, the Capital One Center and Chinatown. Enjoy a hot breakfast each morning as well as a complimentary evening social including snacks Monday-Thursday.Studio or one-bedroom suites offer a full kitchen and living area with spacious work desk and sofa sleeper. METRO Green/Yellow Lines' Mt. 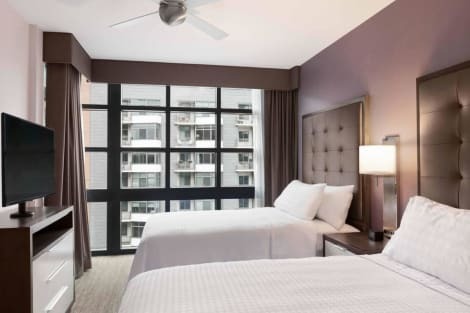 Vernon Square metro station (3 blocks), Red Line's Chinatown metro station (6 blocks).24-hour access to the fitness center, dry-cleaning services, a 24-hour business center and a Suite Shop®.Complimentary internet and fitness center access. Located just two blocks from the White House and three Metro stations, the Capital Hilton hotel is only five miles from Ronald Reagan Washington National Airport (DCA). Set in the heart of the US capital, this downtown Washington, DC hotel serves as a convenient base when sightseeing in this historically rich city. 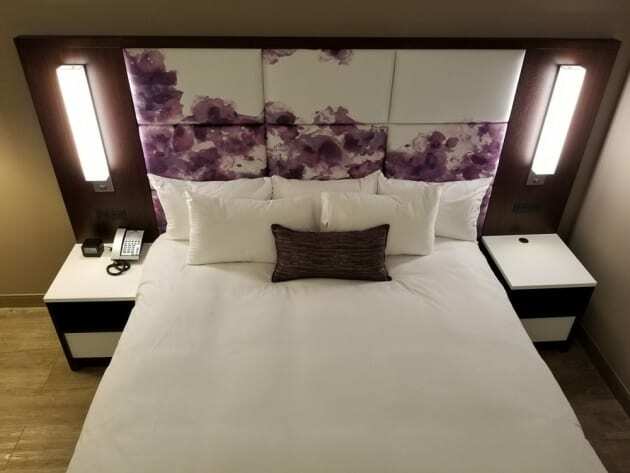 Walk to attractions such as National Mall, the Washington Monument and memorials.Settle into a stylish guest room or a spacious suite, offering high-speed internet access and on-demand movies. Upgrade to an executive room that includes exclusive access to the Executive Lounge and complimentary continental breakfast.Dine at our downtown Washington, DC hotel in the North Gate Grill Restaurant, serving contemporary American cuisine, and then unwind at the Statler Lounge where you can sip classic cocktails in a sleek setting. Indulge at Washington DC’s premier MINT health club and day spa, offering extensive, modern cardio equipment and a studio room for yoga, stretching and core-muscle training. The day spa offers rejuvenating treatments.Set near the business district of Washington DC, the Capital Hilton hotel is the ideal venue for your business meeting or event. Take advantage of extensive meeting and banquet facilities located on the second floor of this downtown Washington, DC hotel. A hotel business center provides convenient services such as photocopying and printing to ensure you keep connected with your business.